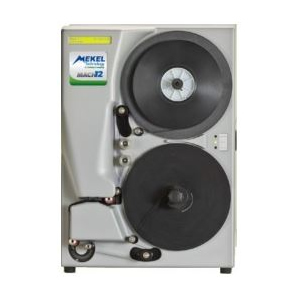 The Mekel MACH 12 microfilm scanner is a production scanner that can scan and convert various types of microfilm into high-quality digital images, including (as standard): 16 mm, 35 mm, up to 1.000′ roll film, and 3M / ANSI / Ektamate cartridges. Mekel MACH 12 microfilm scanner offers up to 750 dpi true optical resolution and scans 100′ roll film in less than 4,5 minutes. With the Mekel MACH 12 production scanner, 100% image capture accuracy and best possible quality are guaranteed. Powered by Mekel Technology’s one-of-a-kind Quantum software (Quantum Scan & Quantum Process), the MACH 12 microfilm scanner offers unrivalled true archival image quality, capture accuracy with excellent tonality and depth of field, and sophisticated image processing of up to 1600 images per minute. Its 12-bit camera exceeds true optical dpi requirements for capture of books, newspapers, manuscripts, financial records, and more. MACH 12 ensures crystal clear scanning of small fonts and highly reduced images, and higher OCR accuracy as a result of better image quality. Ideal for service bureaus, corporations, government, archives, record managers and other organizations with large-volume microfilm scanning needs. Download the complete Mekel MACH 12 Microfilm Scanner Specifications here.